A photo of the author along the fortress walls of Suwon, Korea, December 2005. It is one of the first times (of innumerable to come) that I ventured out on my own in a foreign country. Life abroad started out as a bit of a fluke. I saw a flyer on a snack machine in Allen Hall at the University of Memphis and signed up for a course to start a career I didn’t really know existed. I’d finished graduate school, lacked a definite direction, and decided to get an EFL certification in the Czech Republic. It was the first time I had left North America. I have not lived in the United States since. I didn’t end up staying in Europe long, but this is how the ball got rolling for a decade of living abroad. Trick #1: Get away! Find a way to go beyond the boundaries of what seems blandly comfortable. There’s nothing wrong with people who stay in the same town their entire lives if that’s what they want, but for those of us with a yearning for adventure, a lifetime in a hometown can prove tragic. Go! Explore new ways of living! Find a good EFL certification course, an internship, summer job, or study abroad program. Makes no difference where or what you do, initially you must just get away. While in the Czech Republic, I met people from all walks of life, from all over the world, yet with the same credentials I now have: teaching English as a foreign language. The 3-week course I took in EFL opened up an entirely new world. Some of the people I met had worked all over Africa, Europe, and Asia. Some spent their summers teaching at language camps and were even being paid to go off to incredible countries. They were living what, up until then, I’d thought of as a bit of a dream. Yet they all assured me—each with a similarly knowing smirk—that it was easy to do. Friends, expats and locals alike, come in abundance when working abroad. An unusual reliance on one another creates some of the most eclectic combinations of acquaintances. Trick #2: Make friends. When you’re out in the wide world, as opposed to being stuck in the real world, you’ll meet people who have been out there for a long time. They are full of first-hand information, hard-won advice, inspiring stories, useful connections, and couches to crash on when you are in town. It’s amazing what friends newly made will do to help you get started. In my case, it started by applying for a job at the University of West Bohemia in the Czech Republic, where I’d received my EFL certification. I’d been told that South Korea was a great place to start teaching: good money, plenty of jobs, and an easy transition. So I went to Dave’s ESL Café, the English teacher's portal abroad, and applied for some job postings in Korea. I accepted a job in Ansan, just outside of Seoul, a couple of weeks later. The day after accepting the offer, I was also offered a spot at the University of West Bohemia in the Czech Republic. Surprisingly, it turned out that finding work abroad was far easier than in the States. Trick #3: Just try. What’s the harm in sending out a few CVs to that company overseas, to the cruise ship looking for staff, to the NGO working on a project that you find incredibly interesting? If you were jobless in your hometown, you’d likely put out CVs until something came up. Well, international job boards work much the same: With a bit of effort and persistence, usually in less than a month, you’ll find some sort of steady work. Korea changed my life. One year extended into nearly two and a half. I used vacation time to travel to countries I’d never even thought of visiting: Cambodia, Malaysia, Vietnam, the Philippines, China, Thailand, Singapore, and England. I met my future wife, Emma, a fellow teacher with the same overwhelmed impression of how accessible the world had just become. Neither one of us wanted to go home, so we decided we wouldn’t. When it came time to leave South Korea (even abroad, the time to move on always eventually comes), we went back to the job boards and started looking for work in Latin America. A little later in this story, I marry the English woman I met in Korea, and the fact that our wedding is in Vegas has always amused people for some reason. 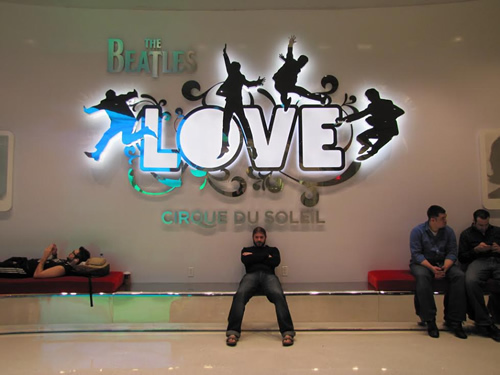 We saw Cirque de Soliel’s Love in lieu of an Elvis ceremony. In Guatemala, where the Latin America job boards brought us, we became part of a new world of NGOs and volunteer work. We got involved with a couple of NGOs, Las Manos de Christine, and Safe Passage, which were in search of teachers just like us. We also learned that life could be perfectly comfortable, rewarding, stimulating, and fun in the absence of a huge salary. In eight months of living in Guatemala City, a place infamous for danger, we also learned that we could be happy just about anywhere. Trick #5: Involve Yourself. Eventually, typically after about three months, regardless of where you are, working is still just working, so it helps to have something else lined up. There are few things that make what you’re doing feel more worthwhile than helping others. There are NGOs all over the world doing all sorts of projects, and they are looking for good people to lend a hand. Then, the world's richness proved too enticing. New experiences, new places, and new cultures were waiting, and who was I to pass them up? For some reason, perhaps the fear-driven politics of the day and my absolute lack of direct knowledge, I wanted to know more about Islam, firsthand. At the same time, I liked my usual evening drink or two after a hard day’s work. I had been living with Emma, not yet my wife, for three years by then. To simplify, I needed a place that could tolerate me, a home that could feel like home. So, I found a city that came pretty close to offering it all: Istanbul. Istanbul remains my favorite city in the world, a fantastic mix of hilltop views, alleyway cafes, and stunning waterways offers a never-ending wonderland to explore. Trick #6: Choose wisely. Whatever the adventures you seek, whatever the safety nets you need, there are destinations that offer them. Based upon my experience, try to go to spots that’ll keep you intrigued, exploring and content. After a while, everywhere becomes home, so pick a good one, with enough of a sense of risk to feel many of the benefits of being abroad, yet also enough of a sense of comfort to feel at home for a few months or for a year. By the time we’d concluded our stay in Turkey, Emma and I had been abroad for five years. We’d learned the ins and outs of the EFL game. We’d made and abandoned homes, collected and said goodbye to friends, and stacked our CVs with credentials and experience. We’d survived one of the most dangerous cities in the world. We’d lived quite happily in distant and different cultures. We’d become, at least from outside perspectives, fearless (we spent the next three months in the Palestinian West Bank). We’d also grown weary of the same old EFL rigmarole everywhere we went. Trick #7: Change up. EFL is without question a fantastic way to get started abroad. The money is good, the jobs are plentiful, and it’ll take you wherever you want to go. However, after a few years, I knew it was no longer the job of my dreams. I had realized that it wasn’t the only way to live abroad, continue traveling long-term, and earn a living. It was time for a change. During our stay in Guatemala City, we’d visited a place called "Earth Lodge" in the mountains outside of Antigua, Central America’s colonial jewel. We’d often taken the trip with our boss in the city, and he’d never forgotten how much we loved it. He contacted us as we neared the end of our contract in Turkey and offered us a new direction. We could live at Earth Lodge, develop an English program at the village school, and expand the NGO that he’d founded: Las Manos de Christine. It was just the right change of pace. En route back to Central America, we got married. 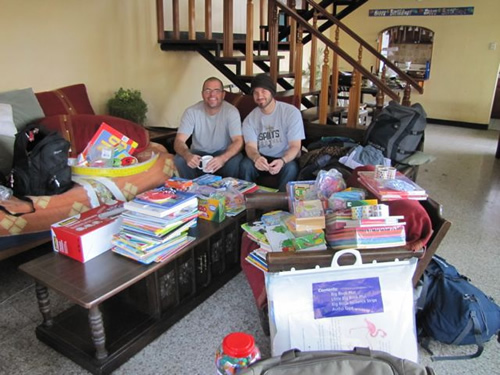 Upon learning we would pilot an English program in a rural Guatemalan school, Emma and I decided to do a massive material-raiser to help us get started. We had to extend our wish list three times because friends, family, and others were so keen on our project. Trick #8: Follow fortune. I mean luck, not money. It’s easy to fall into a rut and become discontent, even when there’s a great café around the corner, olives for a dollar a pound, and a good job secured. If you are in that frame of mind, when a new opportunity presents itself, you should pounce on it. Isn’t that why and how you found yourself abroad in the first place? It isn’t just luck if you seize the moment. Living up on the mountain turned out to be the hardest working year of my life, and probably the most fun I’d ever had. Plus, just as with EFL years ago, a whole new "biosphere" opened up to me. Several actually. Suddenly, I was developing an NGO, managing a hostel, cooking (I became the dinner chef at Earth Lodge), gardening (I helped with the avocado farm), and writing (I put a monthly newsletter for Las Manos), developed website content, and published articles with a local magazine. New pursuits abounded. Trick #9: Create chance. If you want fortune (luck), if you want change, then you’d do best to cultivate situations for it to spring up. Sure, it’s possible to wait for things to fall from the sky, but the more doors you open, the more likely there’ll be a new one to walk through. People always tell us we are “lucky” to live the way we do, but we’ve also done our share to earn our circumstances. After our stay at Earth Lodge, we traveled for three months back to the U.S., visiting my family. We then traveled for three months to England, visiting my wife's family. We taught in Moscow for nine months, with Russia being among the top countries we wanted to experience. Emma taught private classes to save extra money. I started writing professionally. We moved back to Earth Lodge for three months, which turned into four, which then turned into eight. Then, we moved down the mountain to Antigua for another ten months when we were offered jobs for which we hadn’t even applied. Our plan was now to stop looking for jobs and just let things happen what may. It was working. 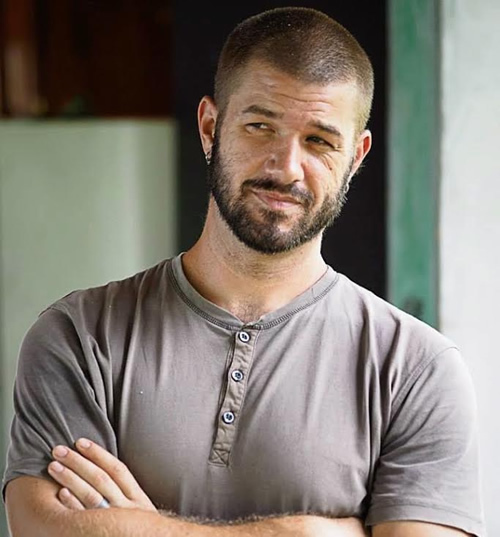 Spurred on by our experience at Earth Lodge, I’ve (we’ve both) fallen in love with gardening and eco-living, which has turned into some dirty, muscle-straining hours of work but also a load of fresh homegrown vegetables and several job offers on farms across Latin America. Trick #10: Work hard. Working hard doesn’t have to mean being miserable. In fact, when you’ve chosen a job well, working hard comes naturally. It’s something you want to do because you are stimulated by it. In turn, people want you to work for them and with them. If you don’t like working hard, chances are you’re not working on the right things. Try to find a new angle. We set off from Antigua, Guatemala nearly ten years after I left the U.S. and Emma left England. We decided to learn more about growing our own food, so we have been volunteering on farms on our way down to Patagonia, however long that takes. In the last year, we’ve not applied for one job but been offered paid positions in Nicaragua (twice), Panama, and Colombia. 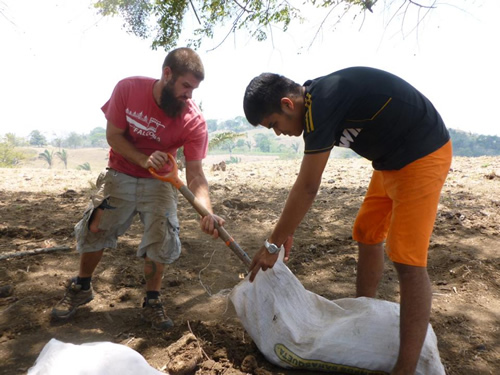 We stayed in Panama for six months, designing a permaculture site and establishing a volunteer program. It was a blast. Ten years ago, I was two interviews away from life as an adjunct professor, one application away from being a doctorial candidate, and thousands of miles away from where I was to become the indefinite expat that I was meant to be. Ten years later, this is the portrait of a happy expat, through and through.